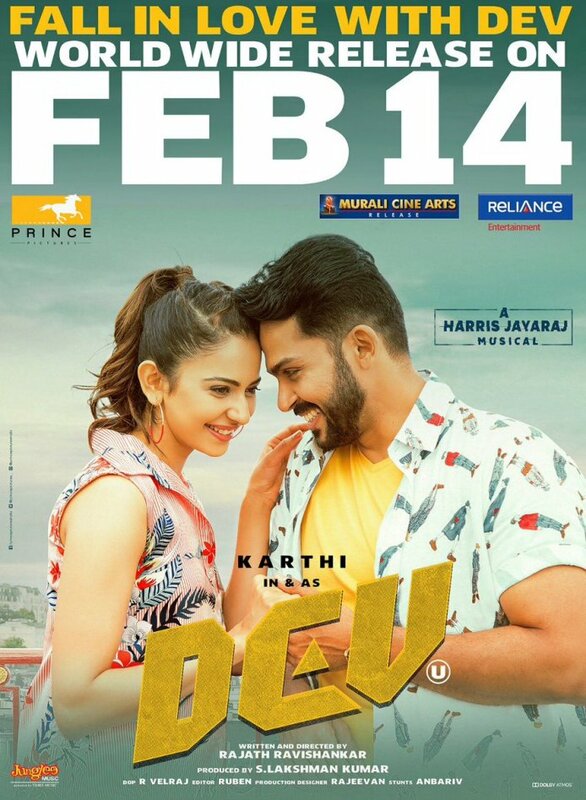 Hero Karthi’s upcoming movie ‘DEV’ is going to release on February 14th, on the occasion of Valentine’s Day. The film’s audio launch was held on the eve Sankranthi i.e, on January 14th and the music is getting a wonderful response. Harris Jayaraj has composed music for the film. This is an action family drama being written and directed by Rajath Ravishankar. Rakul Preet Singh is playing the female lead in ‘DEV’ and it is her second film with Karthi. They are a HIT PAIR. Actors Prakash Raj and Ramya Krishnan will be seen in important roles in the movie while Nikki Galrani is essaying the second female lead. The film has wrapped up all the post-production works. ‘DEV’ will simultaneously release in Tamil and Telugu languages on the above mentioned date. Prince Pictures banner has produced the movie while Reliance Entertainment is presenting it. Cast: Karthi, Rakul Preet Singh, Prakash Raj, Ramya Krishna, Nikki Galrani, Karthik Muthuraman, RJ Vignesh, Renuka, Amrutha, Vamsi, Jayakumar and others.